Tom Hazard has a dangerous secret. He may look like an ordinary 41-year-old history teacher, but he's been a live for centuries. From Elizabethan England to Jazz-Age Paris, from New York to the South Seas, Tom has seen it all. As long as he keeps changing his identity he can stay one step ahead of his past- and stay alive. Tom Hazard isn't your normal man, though he looks forty-one he is actually a lot older. He's mingled with the Fitzgeralds, worked for Shakespeare and Captain Cook and played for Aretha Franklin. But what if you didn't want to live through all the decades again? What if you were just so fed up, that all you want is a normal life? Though being normal in an underground society is hard, they will always find you and hunt you down. The only thing that keeps Tom going is the promise that he made all those years ago and he won't stop, can't stop until he has fixed it all. There are many ways to start a fresh life, to live another identity, to forget and move on. But there are also many things that Tom can never erase and Marion is one of them. 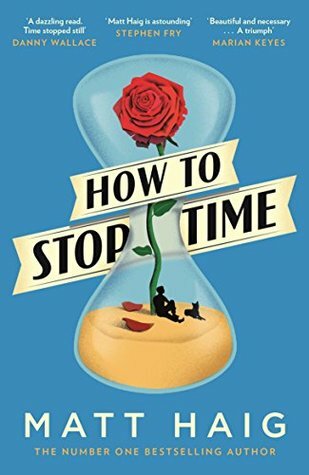 How to Stop Time by Matt Haig, is the first novel that I have read by the author and although it took me a while to get to grips in what was happening within the plot, once I got the hang of it, was beautiful. The story itself is very unique and well thought out, the history aspect and the way that Haig has moulded his story around the past is very clever. The only downside that I would have with this book is that in some places it did take a while to get into and it was a bit long winded at first, but I feel looking back now, that the story did need it. All in all I highly enjoyed this book and will most certainly be reading more by this unique author, if you have not yet read anything my Matt Haig, make this your first read. Lottie collects dead creatures and lovingly cares for them, hoping to preserve them, to save them from disintegration. Her father understands—Lottie has a scientific mind, he thinks. Her aunt wants it to stop, and she goes to cruel lengths to make sure it does. Little Lottie is at a loss without her Mother and Sister by her side. Stricken with grief, Lottie starts to find more creative ways to help ease her pain and memories, though not everyone in the family is keen on her new creative streak. This wonderful book is written in verse and is based around the 1980's. It's the first type of verse book that I have read, it did not disappoint. The story focuses around Lottie, who is silently struggling with the loss of her mother and older sister Annie, the book flits between the past and present whilst giving a glimpse at what her family were like when they were still alive. As Lottie begins to have a fascination with Taxidermy, family members try everything in their power to make the little girl she should be and not the girl Lottie wants to be. The writing and story telling itself is in a way that I would say beautifully morbid, there's a love and sadness that grows within the book and the use of imagery is beautiful. I felt for Lottie as her family couldn't see what she was trying to do. It showed how each character portrayed different stages of grief and how they deal with their own sadness and loss which was a very interesting interpretation. 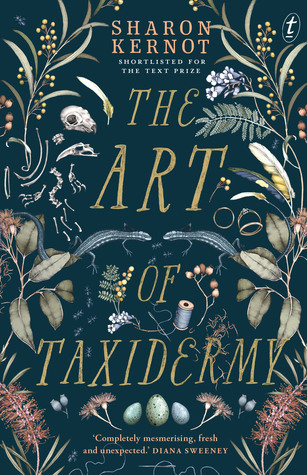 The Art of Taxidermy by Sharon Kernot is a tremendous read and I can't wait for more of her work to follow. Without giving too much away, I thoroughly enjoyed this book more than I thought I would and I would highly recommend. Also, can I just point out that the cover works is absolutely gorgeous and big thanks to NetGalley and Text Publishing for the ARC. However, if you are squeamish towards certain animal natures, then I would advise you to tread lightly. The book will be released in the UK by Text Publishing Company on the 23rd August 2019 and I would strongly suggest picking it up. Look, I didn't want to be a half-blood, I never asked to be the son of a Greek God either. I was just a normal kid, going to school, playing basketball, skateboarding. The usual. Until I accidentally vaporised my maths teacher. Now I spend my time battling monsters and generally trying to stay alive. Percy never asked to be a half-blood, he just wanted to be your run of the mill high schooler. Hanging out with friends and listening to music. Though instead, he gets transported to Half-Blood Academy for nearly slashing his teacher in half with a sword...that was actually a pen. With the help from Annabeth - daughter of Athena and Grover, a strange boy with fake feet and a hunger for tin cans; Percy and the gang are lead on a quest to battle a snake headed woman, three headed dogs and the almighty gods. Though all quests come with a price and to find something you hold so dear to your heat, you have to do the unimaginable and to do so from New York to L.A. in the space of seven days can be a bit tricky. So long as you have flying shoes, tin cans and pudding what could go wrong? I thoroughly enjoyed the first book, it was very imaginative, creative and an all round pleasure to read. There were quite a few funny parts and was highly packed with adventure. 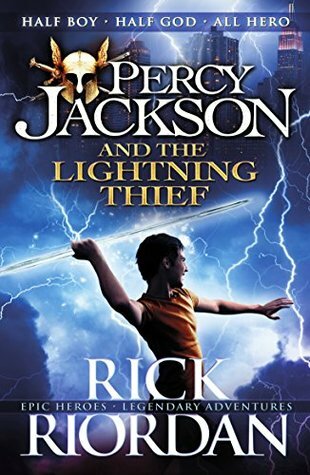 I loved Percy's character and I can say that I have learnt quite a bit more about Greek Mythology, which is something that I love and find interesting. Although a children's book, I think all ages can enjoy Riordan's books, I can't wait to get started on the rest of the series. Rincewind never seems to be able to get it right, no matter what he says or does in life. Last time we saw him, he has just fallen off the face of the Dicworld with his unassigned, utterly useless sidekick - Twoflower. Fortunately for them, they landed in a good place albeit in a different continent, away from home and in the company of Bethan, Cohen the barbarian and a bunch of talking boulders. The good bit being that they didn't die on impact. 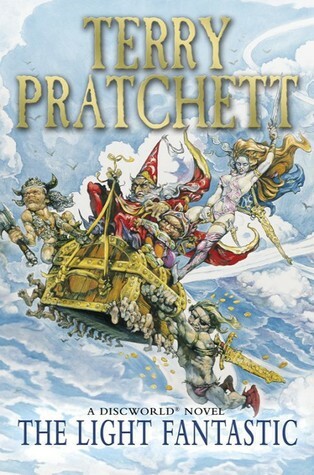 The Light Fantastic by Terry Pratchett, is the second novel in the Discworld series and I can finally say that I got round to reading it, even though it only took another five years since reading the first novel. The story follows on from where it left off in The Colour of Magic , you get to see more of Rincewind and Towflower's friendship which I shall always treasure as its a loving relationship, the kind you get when someone is highly annoyed by them but they still care deeply for them. Never the less, I enjoyed it and the ending was great, I am sad to find out that the next book in the series, doesn't contain both the wizard and tourist but there are more books further down the series where they make a return appearance. I will continue to read the whole series as it is still very enjoyable with some highly hilarious moments in it. Confronted with the truth about Sebastian's identity, she’s thrust into a high stakes world beyond anything she could have imagined. A world that threatens much more than just her feelings. Sebastian’s enemies will stop at nothing to get what they want, and they want her. Sebastian and Sophia's relationship isn't all plain sailing at the moment. He's hiding secrets from Sophia and he wants anything to do with her - yet why does she still love him? Though when Sophia is kidnapped, everything changes. Sebastian has no choice but to let her in on the world of 'The Alpha Group' and soon everything is more complicated than Sophia feared. When someone is trying to sabotage their relationship left, right and centre. There's no option but to run in all directions and hide, but neither of them will go down without a fight. Who is in on all of this? Are secrets best left buried? And who really wants them dead? Unlocked by Maya Cross, is the third and last instalment in 'The Alpha Group' series which I have thoroughly enjoyed. I loved both of their characters, Sophia stayed true to herself and didn't waver to the Damsel in distress kind of girl like are in most books of this genre. The book itself changed towards the end in a way I was not expecting, but in a good way. I would happily read more by this author in the future. In someways the storyline did drag on a bit and there was some repetitions going on with Sophia, but all in all it was a good read. Rose is back at St. Vlad's for her third year, but not without a dark cloud looming over her shoulder. But now with the loss of her best friend, Rose must now navigate her way through her guardian graduation, but is it that simple? Dimitri is there to help her along the way, but how much longer can they go trying ignoring the only thing they want?..Each other. Though there's bigger problems at stake when Rose starts seeing strange things and Adrian is the only person who knows what she's talking about, but can she trust him? As she grows closer to graduation, so do the deadly Strigoi to the school grounds and they won't go down without a fight. Join Rose as she battles her way through yet another year of school, and she starts to wonder if Lissa is actually the sane one in their relationship. Or is she the one that's been mad all along? 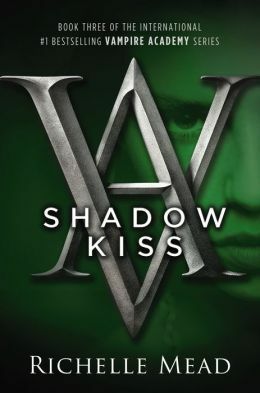 Shadow Kiss by Richelle Mead, is the third instalment in the Vampire Academy series and what a book it was. The book flows on perfectly from the following Frostbite novel and I honestly think its my favourite within the series so far. The story is more intense, more romantic. There's a bit of everything within Shadow Kiss, I cried, I laughed and I was so heartbroken by the end of it, what a roller coaster of emotions! I'm happy that I have found another series to sink my teeth into and can't wait to get started on the rest of the books. The storyline seems to get richer, more in depth as they go through the series and I'm loving that it does. Vampire Academy books have been out for a good few years now, but they're certainly ones that you don't want to miss out on. Ashley Davison is desperate to spend the holidays with her mother in Seattle. Dash Sutherland has an interview for the job of a lifetime in Seattle and must arrive by 23 December. Both frantic to book a last-minute flight out of California, Ashley and Dash collide at the airport to learn that there are no flights and only one rental car available. Ashley desperately needs to get home for Christmas, but she wasn't expecting her flight to be cancelled last minute, nor did she did she think that she would be sharing the last remaining car in the rental park. Dash has an important interview to get to, that he simply can't afford to miss. Though when in the company of Ashley, he starts to think that a couple of hours wouldn't hurt. With only 24 hours to go until Christmas, both Ashley and Dash decide to put their very big differences and opinions aside and decide that driving through the night is the answer. Though some things are best left unsaid and some secrets are better left to rest. Besides, there's only so far you can run away from your past. 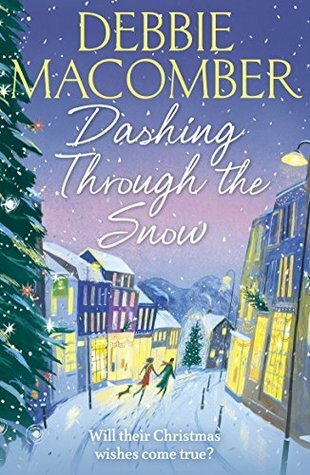 Dashing Through the Snow by Debbie Macombre, is the first book that have read by this author, it was part of my Christmas reads last year and was quite a quick read. I'll be honest, I didn't enjoy the book. My main reasons would be that there didn't seem much depth to the characters, the storyline seemed flat and the overall ending was a bit cliche. For the characters, their relationship seemed forced and it came across as more of a father/daughter relationship rather than a romance. Ashley was quite obnoxious, and Dash just seemed like a 'yes' man. The story itself seemed hopeful at the start, but as I read more it became a bit unrealistic and dead. However, I will give Macomber's books another go as she is such a big author and maybe the book was just a dud for me, I may try a summer romance this time. Hi, My name is Emma and I live in Sheffield, South Yorkshire. I am an avid reader who will read just about anything. 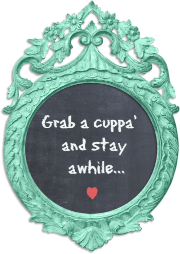 In my spare time other than reading, I enjoy going on walks, cake decorating, crochet and spending time with family and friends. Tink has read 0 books toward her goal of 30 books.